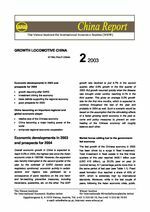 Overall economic growth in China is expected to reach 8.5% in 2003, the highest rate since the Asian economic crisis in 1997/98. However, the expansion was harshly interrupted in the second quarter of the year by the outbreak of SARS (severe acute respiratory syndrome): economic activity in certain sectors and regions was paralysed as a consequence of panic reactions on the one hand and far-reaching preventive measures, including travel-bans, quarantine, etc. on the other. The GDP growth rate declined to just 6.7% in the second quarter, after 9.9% growth in the first quarter of 2003. But growth resumed quickly when the disease was brought under control, reaching 9.1% in the third quarter. This gives an average 8.5% growth rate for the first nine months, which is expected to continue throughout the rest of the year and probably in 2004 as well. Such a scenario would be based on the assumption that the stimulating effects of a faster growing world economy in the year to come and policy measures to prevent an over-heating of the Chinese economy will roughly balance each other. As a consequence of its large population and rapid economic growth over the past 25 years, China has become the sixth largest economy in the world and the second largest in the region. Due to its export-oriented growth strategy, China¿s position is even more prominent in trade, ranking fourth in the world already. Moreover, China is particularly important in certain categories of exports (e.g. textiles & clothing, shoes, electric appliances, TV sets, cameras ) but imports as well (e.g. basic metals including steel, soybeans). It is in these product groups that China may significantly affect world prices and/or may impact on the development of industry in certain countries.